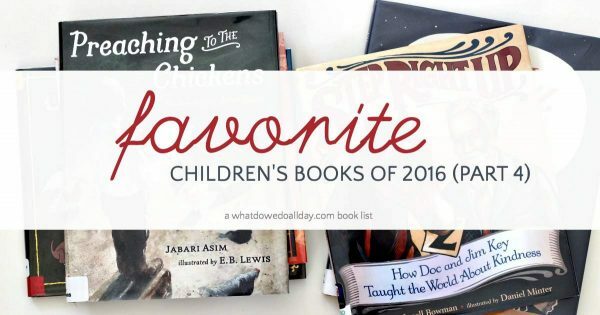 Time to round out the year with some of our favorite picture books of 2016. I know I sound like a broken record, but it is so hard to make these lists every year. I really like we are living in a golden age of children’s literature! Nanette’s Baguette . Mo Willems does it again. This book is so outrageously ridiculous in it’s use of rhyme that few authors could pull it off. Willems is one of those authors. Nannette goes out to buy a baguette. Along the way she meets Suzette and Georgette, and Mr. Barnet with his pet, Antoinette. But she must not forget… the baguette. Do you see how this works? But Willems’ story is so wonderfully whimsical you almost want more rhyming. The ending of the story, with Nanette receiving her mother’s warm reassurance that the day can “reset” after Nanette eats the baguette gave a depth to the story that, frankly, I wasn’t expecting. Willems’ illustrations are equally as creative as his writing. He created cardboard and paper construction sets, photographed them and then used software to integrate with with illustrations. A feat. Ada Twist, Scientist by Andrea Beaty, illustrated by David Roberts. This book has gotten a lot of buzz this year. It Beaty’s third book by Beaty (after Iggy Peck, Architect and Rosie Revere, Engineer) that features an inventive child overcoming obstacles in order to pursue a goal. Ada is one curious child, she asks tons of questions, and wants to investigate everything and everyone. Most importantly, she is fearless. Failure is no obstacle. She is particularly curious about smells and in her investigation as to what makes things smelly she learns (and teaches us) about scientific methods and theories. Inspiring as well as hilarious. Preaching to the Chickens: The Story of Young John Lewis by Jabari Asim, illustrated by E. B. Lewis is a compelling account of a civil rights leader’s early life. Asim stays focused on one aspect of Lewis’ childhood, giving kids a way to truly connect with a larger than life public figure. John Lewis grew up on a farm, working hard every day to help the family. He was delighted when he got put in charge of the chickens. His devotion to his faith inspired him to practice his own ministry on the chickens. He practiced sermons and baptisms on his devoted flock. Lewis’ care for his chickens eventually turned into his devotion to the Civil Rights Movement, but this story focuses on Lewis’ youth. An endnote gives further information. E. B. Lewis’s illustrations shine. The Riddlemaster by Kevin Crossley-Holland, illustrated by Stéphane Jorisch is a great book for parents and kids who like novelty and fantastic illustrations. Three friends want to explore an island, but to do so they must answer riddles. The riddles get harder and harder as a group of mysterious but familiar creature puts on the pressure. This book contains a lot of suspense! Parents and savvy children will understand that the story is influenced by mythology, folklore and timeless children’s stories. There is also a fantastic surprise ending. 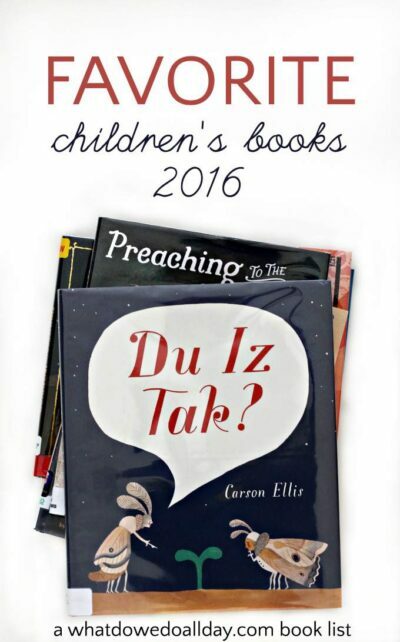 Du Iz Tak by Carson Ellis is a whimsical and unique picture book. The story revolves around the discovery of a sprout and its subsequent colonization by a group of curious and inventive insects. However, Ellis’s characters communicate with an invented language. At first I was skeptical, but the words are so incredibly fun to say and it is so well done that the meaning is clear, and by the end of the book, the reader actually believes he can speak this new language. A Child of Books by Oliver Jeffers. I feel like this could be my biography! A little girl romps through a world made of words and stories. She is accompanied by a playmate and together they scale mountains, sail the seas and climb trees — all things made out of words. Literally. Jeffers uses the text of classic stories like Peter Pan, Frankenstein, and fairy tales to create his illustrations. This is a wonderful book for families whose imaginations are fueled by stories. A Small Thing… but Big by Tony Johnston, illustrated by Hadley Hooper is a great book for kids who have a fear of dogs. At the park, Lizzie meets an elderly gentleman walking a dog. Lizzie has a fear of dogs and the gentleman is timid around children. As the man encourages Lizzie to get to know Cecil, the dog, Lizzie starts to gain courage and self-confidence. After all, it may seem like a small thing to walk a dog, but to Lizzie… it’s big! Presents Through the Window by Taro Gomi. Both my kids (even my 11 year old!) loved this story. Santa is in a big hurry and decides instead of carefully checking his list twice, he will simply peek in each window and toss something inside. The problem is that Santa doesn’t see the whole picture! As a result, his gifts are not quite on target. My kids and I loved the whimsical irony of the story, and pointing out Santa’s mistakes. Each scene has a die cut window to increase the interactive feel of the book. And the ending confirms everything we are taught about generosity during the holidays. The Snurtch by Sean Ferrell, illustrated by Charles Santoso. My youngest son loved this book. I think he found it easy to relate to the main character, a girl who continues to get in trouble but knows that the truth is that the Snurtch did it! The Snurtch is an imaginary and troublesome creature who plagues Ruthie while she is at school. Because of the Snurtch, Ruthie can’t sit still, do her homework, control her emotions or impulses (sound familiar?). After she draws a picture of her Snurtch, her friends become more understanding as they reveal they all have snurtches of their own. A fun book and good for building empathy. The Princess and the Warrior: A Tale of Two Volcanoes by Duncan Tonatiuh is based on a Aztec folk story about the formation of the volcanoes Iztaccíhuatl, and Popocatépet. Princess Izta falls in love with the warrior, Popoca but her father objects and he sets out to prove his worth and defeat a neighboring ruler, Jaguar Claw. Popoca defeats Jaguar Claw, but not before his foe plays a devious trick that ends up with the lovers changed into the iconic volcanoes. Tonatiuh incorporates words from the Nahuatl language (glossary included) and his signature illustrations mirror the dynamism of the story. Some of our new favorites as well here! Great list. Plus you hit on two that I haven’t seen (or even heard about) yet–Step Right Up and Riddlemaster. Definitely need to check those out. I agree with you, I am just floored by the picture book selection these days…it is getting harder and harder to walk into a bookstore and not come away with a giant stack every time.